Savile Row, also called ‘The Row’, is a famous tailor street located in London (Westminster), parallel to Regent Street and New Bond Street. It is well known thanks to the large number of bespoke tailor shops. The term ‘bespoke’ has its origins in the phrase ‘be spoken for’, which means ‘created with the exact size of its owner'. The name ‘Savile’ comes from Lady Dorothy Savile, who built an empire between 1731 and 1735. At the beginning, the street was occupied by officers and their wives and from the nineteenth century onwards, a lot of famous tailors came and settled.there. Unfortunately, there aren’t any left nowadays. The number of tailor shops significantly diminished because of competition. It is worth noting that an association, named Savile Row Bespoke Association, was founded in 2005 in order to perpetuate traditions of that savoir-faire, which helped the shops to remain prosperous. One of the oldest tailor shops is ‘Gieves & Hawkes’. It was founded by two businessmen of the same name. In comparison with today, they used to design ready-to-wear uniforms to supply the British Army and the Royal Navy, which is not the case anymore. 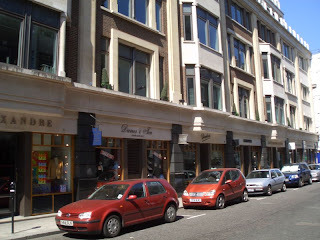 “Henry Poole & co.”, another very famous firm established in 1806, has been located in Savile Row since 1982. It offers customers a large choice of luxury cashmere suiting together with all kinds of accessories. Henry Poole is also known for being the first tailor to enter the Japanese market. ‘Stowers Bespoke’, a third famous tailor, is where Lady Diana, Michael Jackson and General Pinochet are said to have bought bespoke suits. The well-known place ‘Beatles’ Apple Corps’ is located in 3, Savile Row. It was The Beatles’s, Mary Hopkin‘s and Badfinger’s basement. The band also gave a performance on the roof of that place. The place ‘Saville Row’ (spelt with two 'l') in the Monopoly is a mis-spelling of ‘Savile Row’, which refers directly to ‘The Row’. Generally, we can find a lot of references in popular culture, e.g. songs (‘American Boy’, Kanye West ft. Estelle). Savile Row has thus become a real symbol of luxury and is the best place to go, when one can afford to buy a suit there. For years, it has been proved to be an important place for bespoke tailors and this is certainly not about to end.